Our oldest grandsons, now in high school, were spellbound by Thomas the Tank Engine videos when they were young. They played with wooden Thomas and Brio trains for hours, imagining events and stories, engineering track arrangements, and building cities. Our little trains travelled many miles along those simple wooden tracks. I can't walk through a toy store today without looking at the latest engines and wondering if they need to join our collection for the youngest grandchildren to play with. We went to a Day Out With Thomas event with our middle set of grandchildren. A full-size Thomas was there, coupled to a pair of passenger cars. At the other end of the train was a rumbling diesel locomotive, there to do all the pulling and pushing. Sadly, Thomas wasn't a real steam engine. I don't know if the children cared very much. Thomas looked great. His eyes moved. His whistled peep-peeped now and then. I think he produced a puff of white smoke or two. You could stand in front of Thomas and have your picture made. A short train ride was the highlight of the day. The trip was just long enough for Mister Conductor to walk down the aisle of the coach and punch your ticket while local farmland passed by outside. At a crossing, people waved from their waiting cars. Soon we stopped and backed to the station. 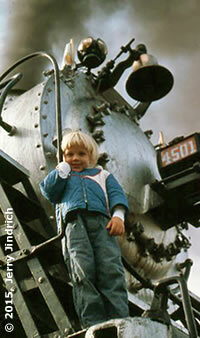 For most young children, it was probably the right length for a train ride. Some were restless. Some wanted more. There were food booths and several exhibits and activities for the children and, of course, a tent full of Thomas toys and related merchandise for sale. It was all very festive. Events like this are important fundraisers for the museums and scenic railroads that host them, and I am certain that most of the children had a great time, but something was clearly missing. You see, there is nothing quite like a real steam engine. It is a living machine with a fire inside, making heat and steam, a metal dragon that hisses and chuffs, with a bright clanging bell to get your attention, a whistle that shrieks and makes you cover your ears, and a smokestack pouring clouds of smoke into the air, raining cinders and ash on your hair and clothing. Real steam engines are exciting, maybe even a little scary. They make deep and lasting impressions. 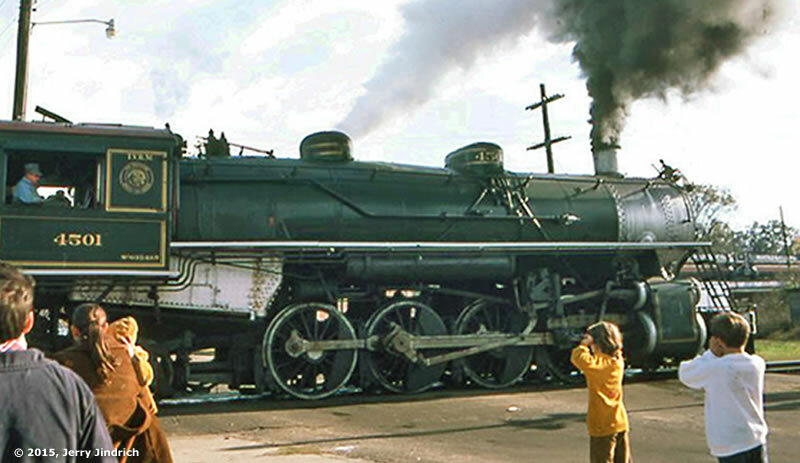 When own our children were young, we drove to Hattiesburg, Mississippi, in November of 1974 to see ex-Southern Railway locomotive number 4501 arrive pulling an excursion train. This was a large, dark green Mikado engine with eight five-foot tall driving wheels. A band played to welcome the train and its passengers. We and other parents posed our children for pictures. We saw coal and water added to the tender for the return trip. Everyone watched the dramatic departure. 4501 was a bit more impressive than Thomas. During a recent vacation, Susan and I visited two of England's best preserved railways, the Bluebell Railway and the Severn Valley Railway. The Bluebell's founders were among the first to build a collection of interesting and historic steam engines when British rail authorities ordered a total conversion to diesel and electric trains. Both railways run steam trains daily and they are a treat to see and ride. 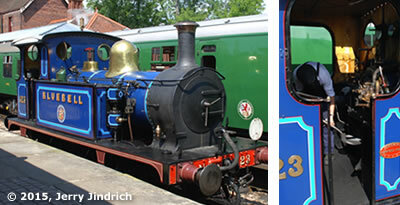 Both have large collections of working engines, some of which are tank engines like Thomas. A charming little tank engine named Bluebell is part of the Bluebell Railway collection and is pictured here with her fireman adding coal to her fire, and posing for a boy and his dad at the end of their special day. If there is a child in your life who loves Thomas, go to a Day Out With Thomas for that first train ride. Support the host museum or railroad, but go back again when they have a real steam engine working, or include a steam train excursion on your next family vacation. You can find a steam train to ride in most regions of the USA (and all over England). A gentle, scenic train ride is usually pleasant. Being pulled by an energetic huffing and puffing steam engine will make that experience especially memorable! Adults can appreciate the marvel that the steam engines were when first invented 200 years ago, how critical they were to the industrial revolution, and how important they were to the building of our country. We should be thankful that dedicated people preserve these machines and keep some running for future generations to know and enjoy. 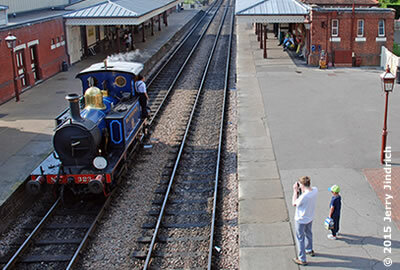 Visit our Great Train Rides links on the main Fun with Trains page to see what your family's "Day Out" could be like on six very different railways.